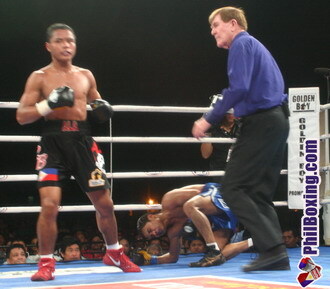 Gonzales grimaces in pain after being hit by Bautista's trademark body shot. After an easy third round disposal of last minute substitute Marino Montiel Gonzales of Mexico during last Saturday's co-feature bout in the world class boxing event dubbed as 'The Moment of Truth' at the Cebu City Sports Complex in Cebu City, Rey "Boom Boom" Bautista now looks forward to his next opponent Argentinian Sergio Manuel Medina, a fight many observers think will be Boom-Boom's first acid test. The Bautista-Medina tussle will open up the PPV telecast of the mammoth fight of the ages Oscar de la Hoya vs Floyd Mayweather boxing event dubbed as "The World Awaits" on May 5, 2007 at the MGM Grand Arena in Las Vegas, Nevada, USA. Both Bautista (22-0-0 17 KOs) and Medina (28-0-0 16 KOs) are undefeated and both will bring with them youthfulness and bragging rights come fight night as the 20-year-old Bautista, the No. 1 WBO superbantam contender, will take on 25-year-old Medina, the No. 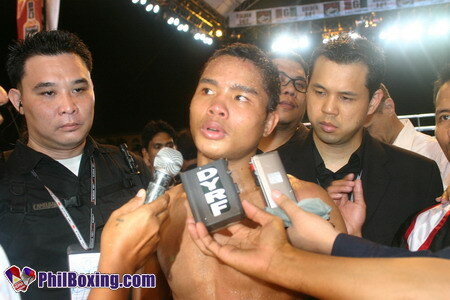 2 contender, for the right to vie for the WBO superbantam crown now held by Daniel Ponce de Leon of Mexico. 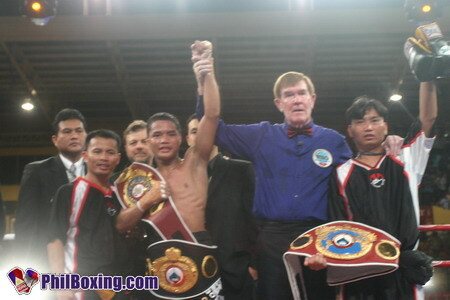 Boom Boom shows his 3 belts atop the ring. From left, WBO Vice President Leon Panoncillo, Edito Villamor, GBP matchmaker Sampson Lewkowicz, ALA's Michael Aldeguer, referee Bruce McTavish and trainer Edmund Villamor. Photo by Dong Secuya. Boom Boom answers questions from the media on the way to the dressing room with his manager Michael Aldeguer and trainer Edito Villamor (partly hidden). Photo by Dong Secuya. The May 5 fight will answer many questions raised against Bautista's legitimacy as an elite fighter. Bautista had been tagged as heir apparent to Philippine boxing icon Manny Pacquiao by many boxing experts and by Pacquiao himself. Oscar de la Hoya, whose Golden Boy Promotions hold Bautista's promotional rights, had declared that Bautista is the real deal and had said that he will make Bautista bigger than Pacquiao himself. De la Hoya had personally instructed his matchmakers to put Bautista as the PPV opening act of the May 5 event.